Living With Your Psychic Gifts – Listening to your intuition does not need to be painful. Do you have unexplained headaches, dizzy spells, sleeping disorders, mood swings? Have you suffered from depression? Do you see flashes of light? Are you anxious in crowded places? Have you had strange visions, or unexplained psychic experiences? Have you suffered from psychic attacks? Would you like to “Just shut it all off” and “Make it go away”? If you have some or many of these psychic symptoms, and been told by one doctor after another that “Nothing is physically wrong with you”, it is possible that you have unfocused and undiagnosed psychic talents. You may be empathic, psychic, or “hyper-sensitive”. There could be damage to your psychic aura. You may need to learn psychic protection techniques to drive off psychic vampires and psychic attacks. My name is Brandi Jasmine. I have worked as a professional psychic, astrologer and writer for since the early 80’s. My book/eBook “Living With Your Psychic Gifts” was written to help you develop psychic protection and self-defense techniques. When I first realized that my personal challenges were in fact signs of a psychic gift, I felt lost and alone, adrift in a sea of questions. I doubted my own sanity at times, as I struggled with strange dreams, visions and sensations. Then one day I met some other psychics, and started to accept that I did in fact have psychic gifts, and to learn how to live with my psychic abilities. It was such a huge relief to discover that I was not alone. I often find that many of the people I meet are as psychic as I am, yet they lack even a basic understanding of the principles involved in dealing with psychic experiences. Sometimes these people are born with the talent, but often they have accidentally left themselves “wide open” psychically after a workshop, lecture, or meditation seminar. They may have “played a game” with an Ouija Board and are suffering from bizarre, sometimes frightening experiences. They may have done nothing unusual, but have been psychic their entire lives, with no frame of reference to understand what was happening. Regardless of the cause, the basics of psychic protection are utterly foreign to them, and they don’t know where to turn for help. It is a terrifying state of mind to be in, searching the halls of the library or bookstore for help and information, and many people are frightened to speak out to others, to seek help, for fear of ridicule. I know, because I spent years trying to find out how to protect myself from unwanted psychic intrusions. I found many books written about psychic protection. Most psychic protection books seemed to be directed at serious scholars or students of metaphysics. Those that were not bombastic and wordy seem to be directed at what is called the “Pop Culture” market: supermarket tabloid astrology booklets are a good example of this genre. Some books were filled with wild metaphysical filler or religious dogma. While there are now several good psychic protection books available (and some are mentioned in our Recommended Reading Page), many are still packed with unnecessary filler to meet arbitrary publishing standards. Wading through volumes of information to find one simple, straightforward, easy to read book on psychic protection can be a daunting task. As you flip through the pages of “Living With Your Psychic Gifts”, you will discover simple yet effective techniques to turn down the volume of your psychic sensitivity. The psychic protection exercises can be practiced by anyone of any religious or spiritual faith or level of experience. 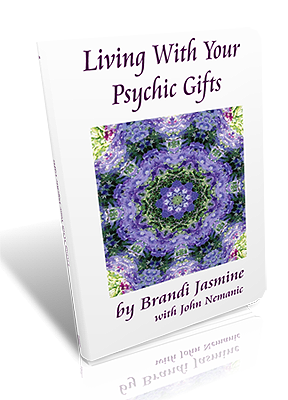 “Living With Your Psychic Gifts” is designed with the beginner in mind: all new jargon is explained, because it is assumed that most readers are approaching the subject for the first time. Don’t waste another day suffering alone in silence! Imagine yourself confidently using and understanding your psychic gifts in a positive and productive way. Imagine being able to joyfully walk down a busy street without feeling crowded and anxious. It will take determination and practice, but it is possible to control your psychic ability, instead of letting your psychic gifts control you.